Are you seeing spots? Yes you are! There is a rainbow of colors with cheetah spots in this sassy pinwheel bow. The base is a chocolate brown grosgrain ribbon that is topped with a pink and brown moon stitch ribbon on each of the 4 corners. 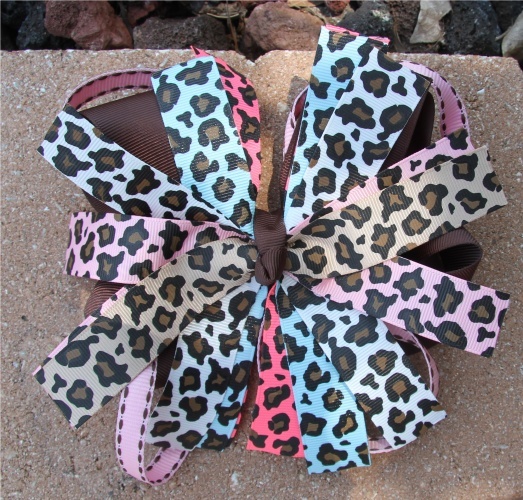 The top pinwheel has an assortment of turquoise, light pink, hot pink, cream and light brown ribbons that all have cheetah prints. It is wrapped by a brown center and attached to a French clip. Get your cheetah prints and GO WILD!